Palm trees, those beautiful symbols of tropical climates, also provide benefits to homeowners who decide to plant them. Anyone who’s lived in a home with deciduous trees knows the “joy” of raking leaves by the bagful. Palm trees also lose their leaves, but not all at once; this makes them perfect for those who would rather that raking remain a memory. Palms also provide “instant landscaping”, in that they beautify just about any spot in which they’re planted. Lastly, palm trees are low maintenance plants. Palms run a close second to conifers in the low level of attention they require beyond the basics. And, to top it off, they’re fairly easy to plant, too. All plants have preferences when it comes to light. Some like full sun, while others prefer shade. Palm trees are no different. It’s important to research the type of palm you’re planting; otherwise, the results may be less than satisfactory. Fortunately, there are more varieties of palms than you can shake a frond at: they vary in size from small (10′ – 20′ for the Windmill Palm) to very large (the 50′ tall, aptly-named Queen Palm). 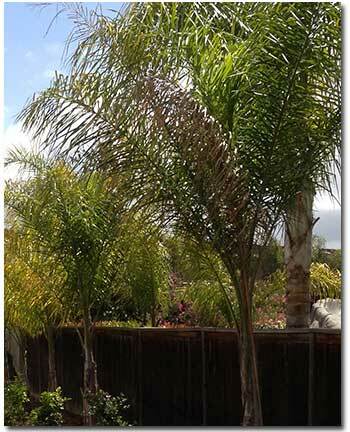 Planting a shade-loving palm in full sun produces a burnt – and eventually dead – tree; while planting a sun-loving palm in the shade gives you a weaker tree with a thicker trunk and stretched-out leaves. Another concern people have with the tropical-appearing palm is temperature. Actually, palm trees grow in almost all climate zones, depending on the type of palm. As with light, good research into temperature needs – or better yet, asking an expert at Grangetto’s – is crucial to having a healthy, happy palm tree. Most palms fare pretty well in both soil types, acid or alkaline. There are a few you have watch out for, as they are quite particular. The Queen Palm, for instance, prefers acidic soil. However, with the amazing variety from which to choose, it should be no problem selecting the perfect tree for your soil type. One piece of advice for all palms: The soil must have good drainage. Using a soil amendment such as Kellogg® Palm and Cactus Mix when planting in pots or mix with your native soil when planting the ground will help give your new palms good drainage. Providing your palms with the right amount of moisture keeps them healthy and happy. Palms are somewhat picky about moisture levels; some prefer being watered once a week, while others like water five times a week. Variety may be the spice of life, but if you want your palms to thrive, group them according to moisture preference. Otherwise, some will flourish and other will fail. Once all the work of choosing the right palms for your soil and lighting is done, it’s time to plant. This can be delicate work, so be careful. The palms heart – the area from which the leaves grow – is very sensitive to being handled. If it cracks or shatters, your palm tree may die, or at best, be stunted in growth. Likewise, the root ball requires careful handling. It’s best to cut the container away as this helps prevent damage to the sensitive roots. The hole should be dug twice the diameter of the root ball and no deeper than the root ball. Make sure the hole is level, such that the bottom of the trees trunk is even with the ground. Once the tree is placed, fill the hole with loose soil to promote healthy root growth. A last piece of advice is to avoid planting during particularly dry spells; young palms are vulnerable to weather changes.